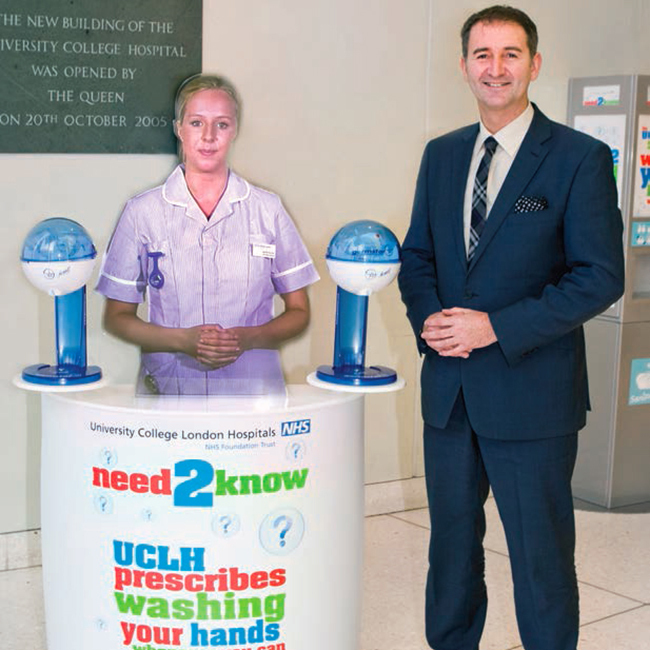 UCH looked to find a way to increase hand hygiene compliance at Euston Road. Only 2.1% of visitors were using the hand gel dispenser and this needed to be drastically increased. 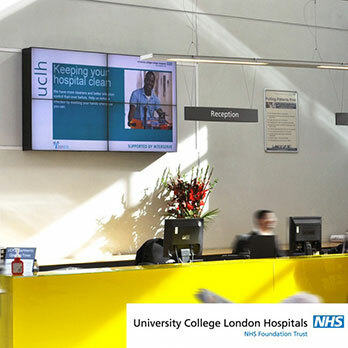 Observation and feedback of the virtual nurse information unit in the main UCH atrium has been very positive. This innovative and engaging way of imparting key healthcare messages works extremely well. The unit offers complete flexibility on message – (including the script, the model used, their gender and role etc), installation and is easy to refresh messages to reflect emergent issues or seasonal awareness or information campaigns. I have witnessed how effective the unit is in drawing people to it and engaging with them and there are opportunities to use the unit as part of our meet and greet and way finding procedures. The initial messages at UCH have been focused on hand hygiene compliance and a ‘use the gel’ campaign and the unit has proved to be very effective in this regard. 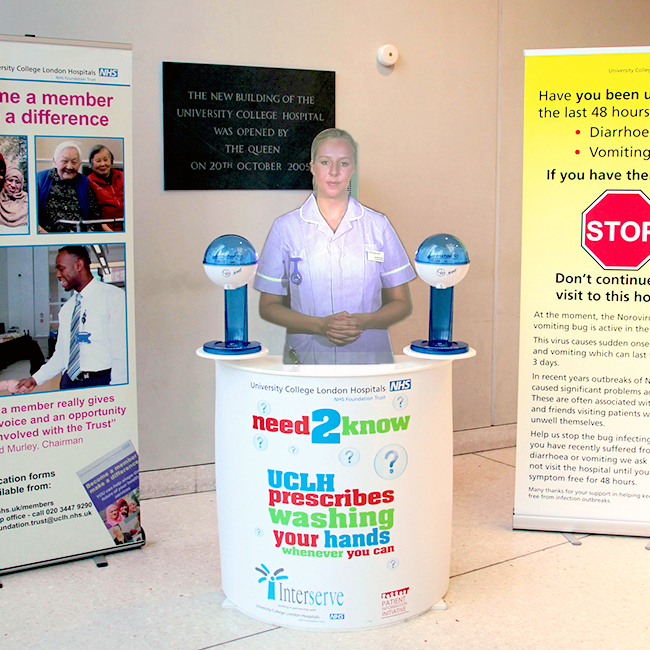 UCH installed a “virtual nurse”, a holographic mannequin positioned in their main entrance on Euston Road. The mannequin was filmed detailing a variety of hand hygiene, PALS and way finding messages and had two hand gel dispensers on either side of her. 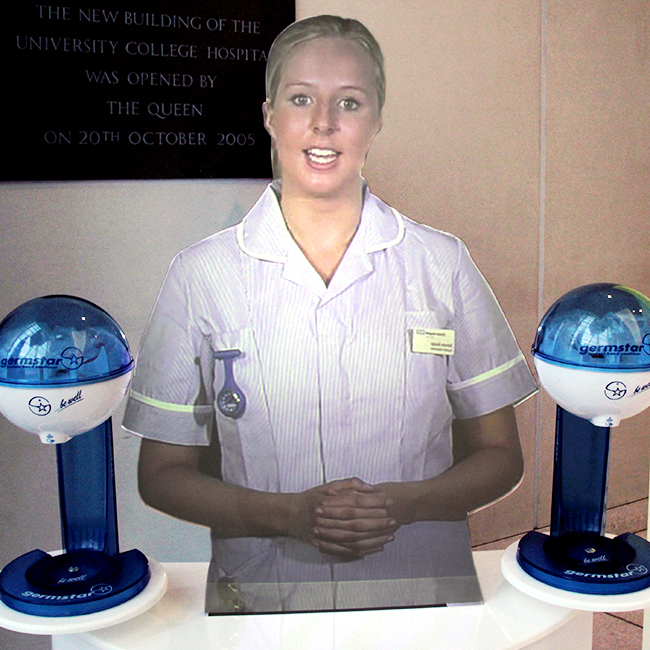 After the virtual nurse was installed, 33% of visitors stopped to use the hand sanitiser. There was also a marked increase in visitors stopping to listen to the messages being played, with 173 people stopping over a two hour period.